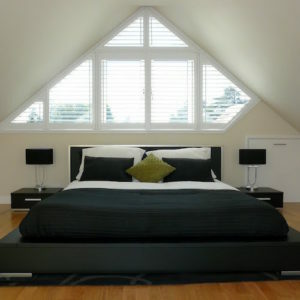 Window shutters Padstow by Just Shutters – your local experts! Just Shutters are the premier Plantation shutter company in Padstow and the surrounding areas and we would be delighted to show you why. Call us on 01872 306442. We are specialists in the field working only with beautiful, bespoke Plantation shutters. Enhancing your rooms with the finest quality shutters, offering the widest range and a lifetime guarantee, call us on 01872 306442. We at Just Shutters, pride ourselves on the best selection of materials, colours and overall finishes. Giving you so much choice whatever your style! Our Plantation Shutters are made to measure so can be made for even the most unusual of window shape or size. Whilst any window or door can be enhanced by shutters, be it square, rectangular or bay, we can make stunning shutters to fit all shapes and sizes including angled, arched or perfect porthole, even glass roofs and conservatories. In fact we have delighted many customers who simply could not find other window dressings to fit! More and more home owners are choosing shutters for their timeless good looks. Their luxurious quality and style, as well as many additional benefits. The light and shade options, allowing privacy and ambient lighting simultaneously, as well as the enhanced value they bring to a home. Equally the fact that they are maintenance free and are wipe clean and require no laundering. Shutters are also hardwearing and do not fade warp or bleach in the sun like many alternative window dressings. Add to this the noise reduction, dust and allergen reduction and increased energy efficiency of the home, and shutters become a must have investment. Just Shutters Padstow, are your local experts. A family run company, Just Shutters specialises in bespoke interior plantation shutters, also known as wooden shutters or shutter blinds. Our passion and professionalism is reflected in all we do and as such we have earned an unrivalled reputation for quality and perfection. Please see just a few of our many hundred customer testimonials below. To find out more, call Just Shutters on 01872 306442. Plantation shutters top to bottom in 3 story b and b.
Fitting 3 shutters on windows and 1 pair of shutter doors.